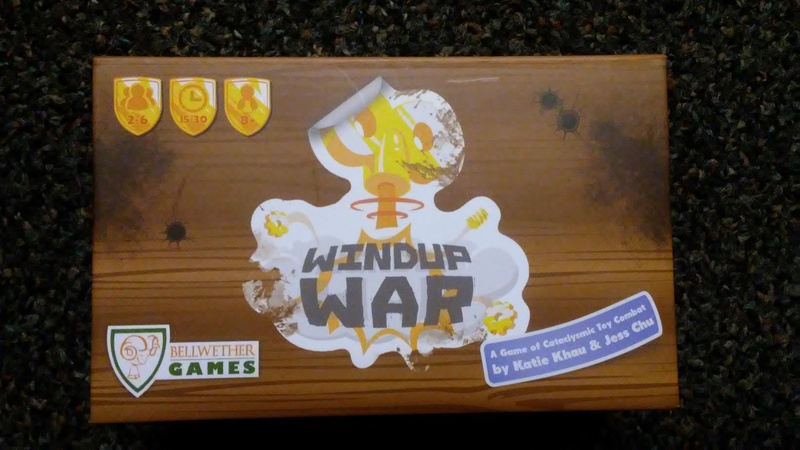 Windup War is a game by Katie Khau and Jess Chu, published by Bellwether Games. It is for 2-6 players. In this game, players will command a wind up toy army as they seek to destroy their opponents. They’ll need to plan attacks, prepare their defenses and charge the battlefield if they hope to become the last one standing. Of course if they can score enough points first, they will be declared the winner. To begin, players are each given a faction box. They will then empty the box and assemble their army from the cards of their faction. Each player will place their Life card in front of them vertically with the card pointed towards the center of the table. They must then select 3 of their Unit cards to be in their army during this particular game. The remaining units are placed back inside the faction box. Players must then select the order in which each card will be activated. 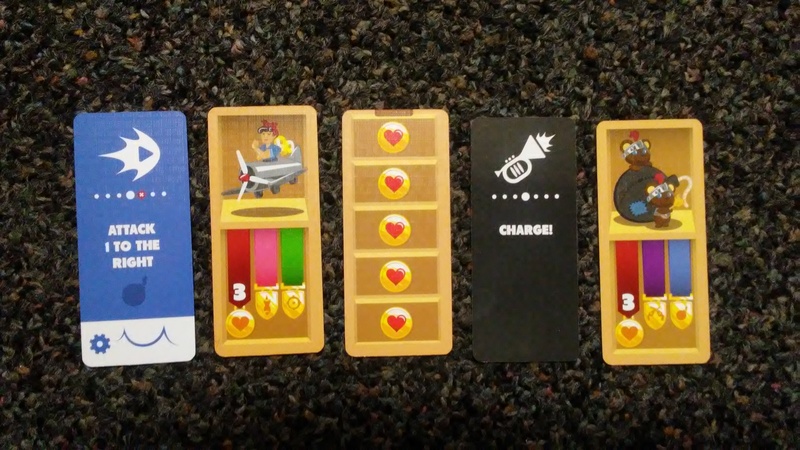 The first unit is placed on the player’s Life card vertically so that it covers up all the hearts except for those equal to the number of hearts allowed by the unit card. The player’s second and third unit are placed in order horizontally below their active unit. The Win Tally card should then be placed back into the player’s faction box, but will be used later to record wins. The remaining set of Action cards are place into the player’s hand. Play now begins. The game is played over several rounds. Each round is divided into 2 phases; the Windup and the War. The first phase is the Windup phase. In this phase players will place any 5 of their Action cards into a face down row to the right of their active unit card. The cards should be placed so that the first action the player would like to use is closest to the active unit card and the last action is farthest away. The second phase is the War phase. This phase begins once all players have placed their 5 Action cards. Players will then announce, “Ready…Aim…Card 1”. Each player will then simultaneously flip over their first Action card. Each Action card is then resolved as if the actions happened simultaneously. Once the first Action card has been resolved by all players, they will then announce, “Ready…Aim…Card 2”. This continues until all 5 of a player’s Action cards have been resolved. Once this happens, the round is concluded with each player moving all the Action cards they used earlier to their discard pile on the left of their active unit. A new round begins with each player selecting 5 new actions. There are a few things that should be mentioned about the game. First off, Action cards when played will affect other players based on where they’re sitting in relation to the player that played them. For this reason, players should be sitting where it’s easy to determine who is on the player’s right and left. Next, Action cards come in 6 different colors. Units can only take actions that are the same color as the ribbons on their unit card. However, any unit can perform black actions. If a player happens to have played an Action card that their active unit can not take, this is an illegal action. If the player was attacked at the same time as the illegal action, then the illegal action counts as a Block All Attacks card. If the player was not attacked, then the illegal action breaks and must be turned 180 degrees and placed under the player’s Heart card with the bouncing gear side facing the center of the table. If a player has 3 or more of these broken cards beneath their Heart card, they must forfeit the game. Next, there are the Charge cards. These cards are how players score points. When a player plays a Charge card, they must first check to see if any other players played a Charge card at the same time as they did. As long as there were no other Charge cards played, then the Charge is successful. If they did, then the Charge cards cancel each other out. If not, then the player may immediately move one card from their discard pile into the center of the table face down to count as a point for that player’s faction. Finally as the game is played, a player’s active unit will wing up taking damage at some point. When this happens the player must move their active unit card so that it covers up one additional heart for each damage taken. When all of a unit’s hearts have been lost, the unit is destroyed. Before the next Action card is revealed, the player should removed the destroyed unit card and place it out of the way. The next unit in combat order should then be placed vertically onto the life card in the same way as the first unit was during setup. Once a player’s third unit is destroyed, they are eliminated from the game. The game continues until either all but one player have forfeited or have been eliminated by losing all 3 of their units. The remaining player left standing is the winner. Likewise the game can end if a player scores their third point. In this case, that players is the winner. In a 2 or 3 player game, the number of points is 4. This game consists of a bunch of small thin cards. Not to say that the cards aren’t thick, what I mean is that the width of the cards is thin. Just take a look at the picture above. The game comes with 6 different factions that can be played. Each one comes in it’s own little box with a life card and a win tally card. The quality of the cards is really good. It has like a linen or satin finish on them. The artwork is rather cute and fun with a cartoonish style to it. The box that everything comes in has a magnetic closure on it with plenty of room in case the designers decide to create some expansions. I like the artwork and box. Both of these are really well done. The thing that kind of feels odd is how small the cards are. They are almost Euro sized except that the width is just a little wider than my thumb. I’ve never played a game with cards this shape and size before. I will say that it’s kind of cool that you can just grab a couple of faction boxes and slip them into your pocket like you would a pack of gum. The game is highly portable this way. Overall I think the design is rather unique and it seems to work for this game. I’m pleased with the look and feel. The rulebook for this game is rather small as well and fits nicely inside the game box. There are plenty of pictures and examples. There’s a very good example of game play at the end of the book. Every step of the game is explained rather well. There should be nothing that is difficult to read or understand. I especially like that all the action cards are explained in detail. This is really helpful as a reference in case any questions arise. Overall I think the book does a good job explaining everything and it looks nice as well. I didn’t really see anything to complain about. This is a quick and fun little card game. I really like it as a 2 player game. It’s very quick and easy to play this way. Of course if you like a little more chaos, then playing with more than 2 is the way to go. In this way, as you’re playing and players start getting eliminated then your target moves and while you thought you were going to be attacking one player, all of a sudden you’re attacking a different one, or even yourself. This level of unpredictability makes the game rather interesting. As I said, it’s rather quick even with more players, however there’s still plenty of strategy to the game. Knowing which moves to make and when to make them is key. It’s also important to know when to use an illegal action to be able to block a suspected attack as well as when to charge to get those points. In some ways this game reminds me of an amped up version of War with some Uno mixed in. I rather like the mixture and think it tends to work quite well. Overall, this is a light game that can be played with the whole family. I would recommend giving this one a try. Windup War is a light weight card game of battling wind up toys. The game is fairly quick. Most game sessions last around 20 minutes or so. The artwork is light and fun with a cartoonish feel to it. The cards are an unusual size that feels a bit odd, however the quality and finish on each one is very nice. The faction boxes are the same size as a pack of gun making the game highly portable. The game is fun with a mixed feeling of War and Uno combined. It’s fairly simple to play and easy enough for even younger players to enjoy. There is a bit of strategy but it’s not very heavy. Fans of light weight battling card games should enjoy this one. I’d recommend giving this one a try. It’s unpredictable and fun for the whole family. This entry was posted in Reviews and tagged bellwether, bellwether games, board, board games, card, card games, chu, games, jess, jess chu, katie, katie khau, khau, war, windup, windup war. Bookmark the permalink.